After working on the recipe development for the boozy Baileys Irish Cream Chocolate Macaron Recipe, I still had a decent amount of the delicious liqueur leftover so I decided to create a second filling with it since, as I told you last time, I went through just a little bit of trouble purchasing this alcohol at the store. I really should make good use of it. 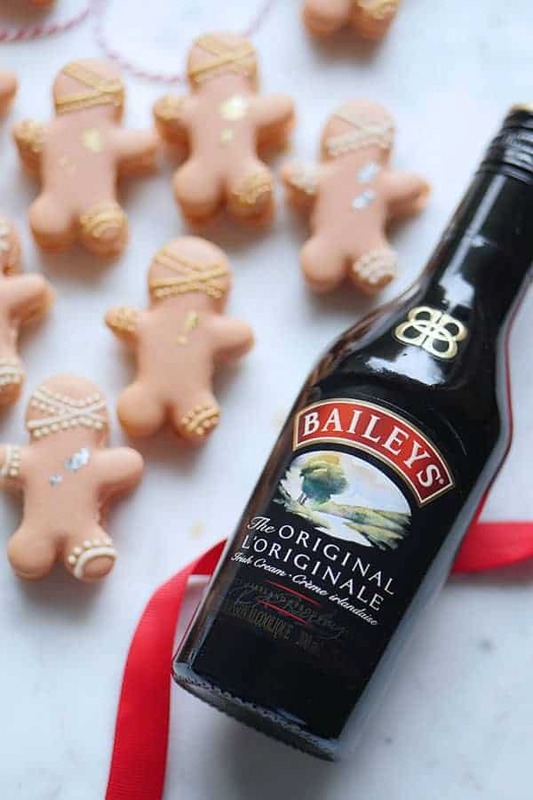 The Baileys chocolate filling from my last post is great for the chocolate lover and has that certain boozy kick reminiscent of those cute miniature liqueur filled chocolate bottles. This recipe is a lot creamier with a more subtle nuance of liqueur. 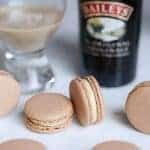 The cream is quite delicate both in flavour and texture, and c’mon with the name Baileys Irish Cream, it just seems wrong not to make a creamy filling with it. 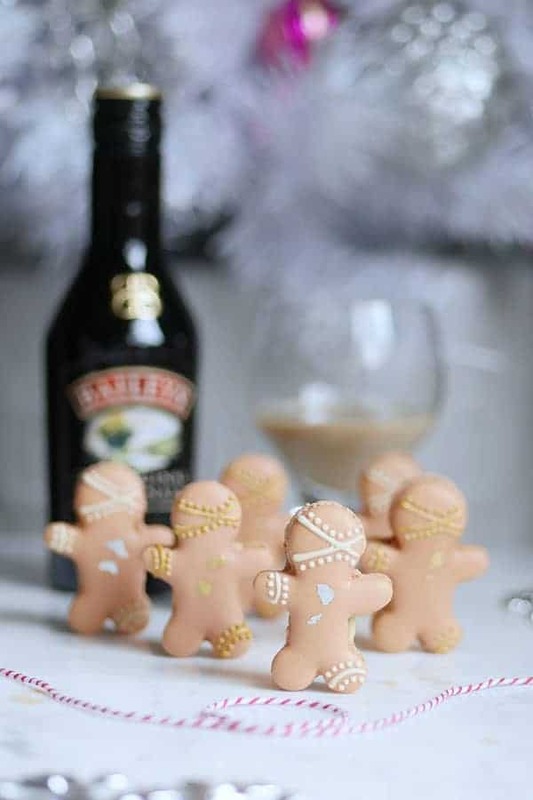 As for the decorative design on these little guys, I added an abstract motif with a royal icing made from, you guessed it – Baileys Irish Cream. 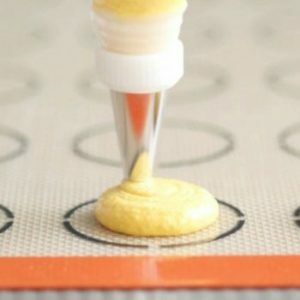 After piping your design, wait until it dries completely before adding the edible gold paint on top. Waiting until it dries completely will help prevent the icing from wrinkling once the paint is added. 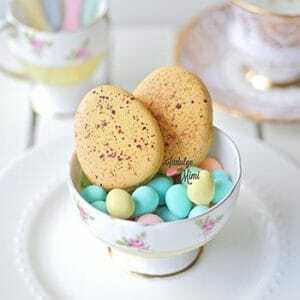 I also applied edible gold and silver flakes on top to give it a chicer look. I’ve provided a recipe for the macaron shells and filling, both yielding different quantities. The macaron shell recipe yields 12 macarons while the filling yields enough to fill 60 macarons. This is deliberate as I like to provide the smallest recipe possible so you can test out the recipe before committing to a large batch. 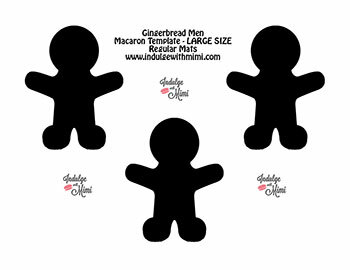 This is especially useful for making macarons since as we all know, they don’t always turn out the way we want the very first time. Just keep in mind that my Best Macaron Recipe for the shells can be doubled, tripled or even quadrupled to match the amount of filling in this recipe. The recipe for the filling could not be reduced any further since it was the smallest amount that could be made while containing one whole egg. Which One is the Winner? Baileys Chocolate, Baileys Cream or the Hybrid? I made several batches of both Baileys fillings and each time, it was hard to decide between the two. When I devoured the chocolate one, I wanted the cream one next and vice versa. So in the end I also tried piping a ring of the chocolate version on the outside while filling in the center with this creamier one. I really loved that version as well. Give all three versions a try and let me know what are your thoughts. I hope you enjoy the recipe and templates I’ve provided below. 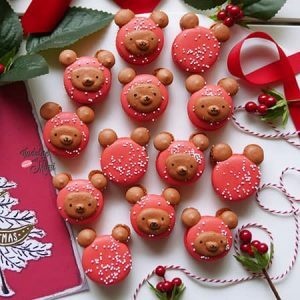 Happy winter bakes to you! This recipe can be doubled, tripled or quadrupled to accommodate the amount of Baileys Irish Cream filling you'd like to make. 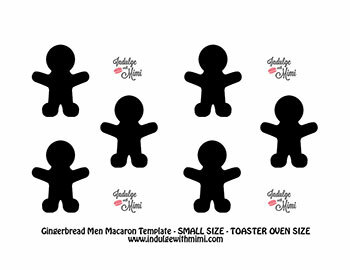 There is enough batter here to make 12 round macarons or 12 gingerbread men with the template provided at the end of this post. In a bowl, sift the spices along with the almond flour and icing sugar. There is enough filling to fill approximately 60 macarons. 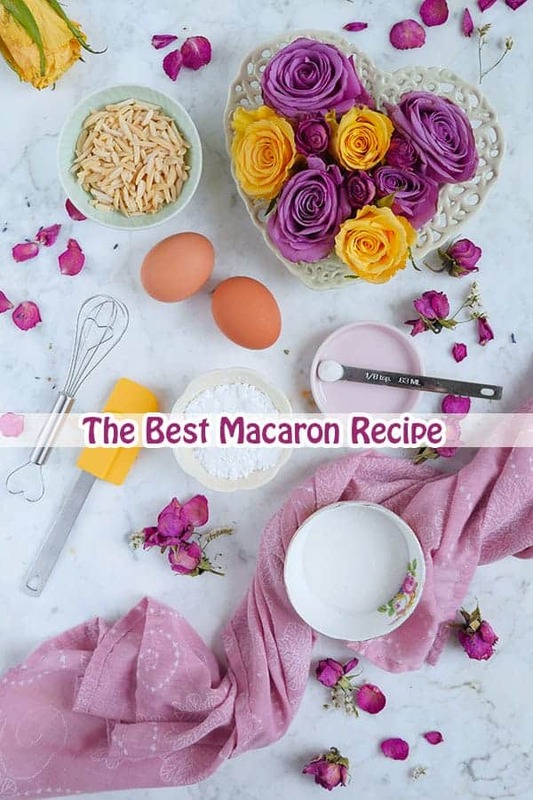 This recipe was scaled to the smallest amount possible while using 2 yolks and 1 whole egg so there will be leftovers if you are using my Best Macaron Recipe above for the shells. 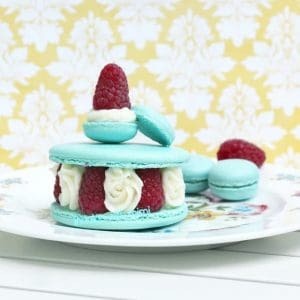 But please note the Best Macaron Recipe can be doubled, tripled or quadrupled. Alcohol will remain in the filling. 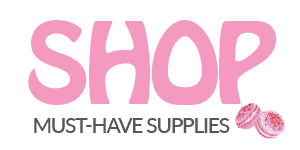 Take caution when serving to children, pregnant women, the elderly and those with compromised immune systems. Always remain vigilant when heating up alcohol as it can cause a fire. Sift icing sugar and meringue powder into a mixing bowl. Add 1-2 tsp of Baileys liqueur to the dry mixture and stir with a spatula to get the mixture going. If it's still lumpy, add another 1 tsp of liqueur and stir again. Add the rest of the liqueur with a spray bottle by slowly spritzing it onto the mixture until it reaches the proper consistency of a "15 second" icing. When a knife cuts through the icing, it will take 15 second for the cut to disappear. 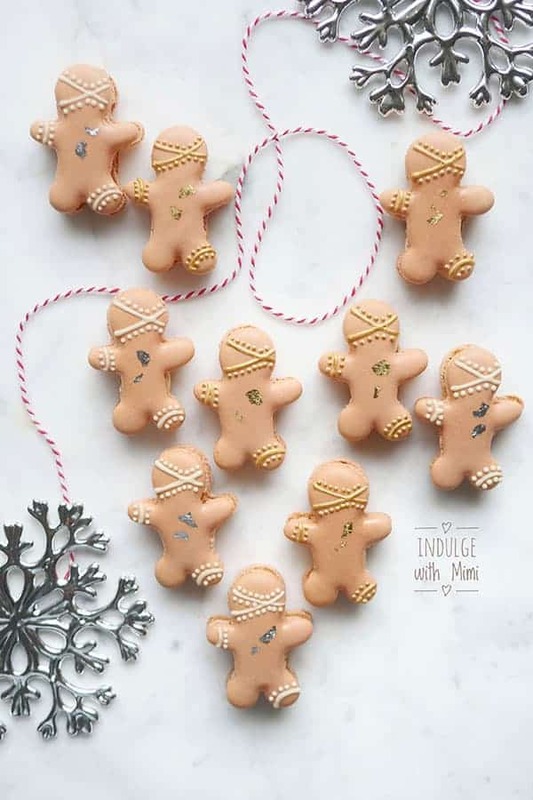 Place in a piping bag and seal the ends so the icing doesn't dry out. Pipe desired design onto the gingerbread men and wait at least 12 hours for the icing to dry before adding edible paint on top.